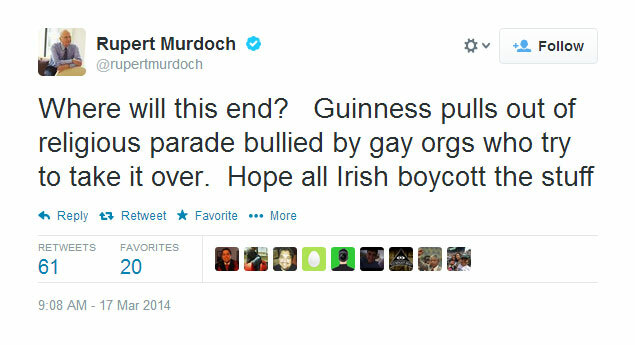 Guinness announced that it will not participate in the New York City St. Patrick's Day parade due to the parade's exclusion of LGBT groups, prompting outrage and calls for boycott from right-wing media figures. Irish brewer Guinness said on Sunday that it would not participate in New York City's St. Patrick's Day parade this year because gay and lesbian groups had been excluded, costing organizers a key sponsor of the annual event. The move came on the same day that Boston's Irish-American mayor skipped that city's St. Patrick's Day parade after failing to hammer out a deal with organizers to allow a group of gay and lesbian activists to march openly. 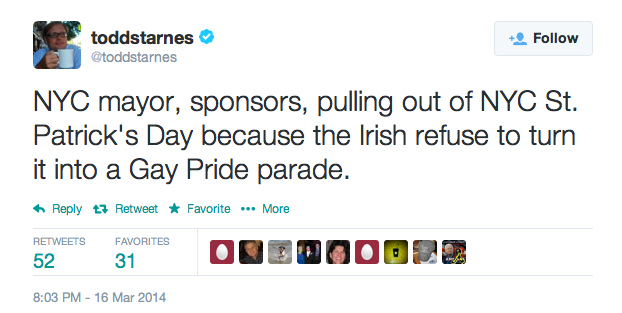 "Guinness has a strong history of supporting diversity and being an advocate for equality for all. We were hopeful that the policy of exclusion would be reversed for this year's parade," the brewer said in a written statement issued by a spokesman for its parent company, Diageo. INGRAHAM: But Guinness, OK Guinness Beer is the latest beer giant to withdraw its support because lesbian and gay groups are not allowed to march openly in the oriented parade with gay signs. pulls out?! Now, this -- I've just got to say. I find this to be totalitarian in its feel to me. This idea that, if we can't be a part of your event, we are going to shut you down. Now think about that. Do they really want a situation where groups that totally disagree with them, or have just a different focus than they have, try to shut down aspects of the gay parades in New York? And there's a big, you know, gay parade in New York. And people have a lot of fun at it, it's very colorful, very interesting. But I don't think people are trying to damage their parades, or are they? I must have missed those stories. By saying oh we -- I'm trying to think of an example -- well we, evangelical, Bible-believing Christians, want to hold up anti-gay signs at the gay parade. And if we're not allowed to do that, then we are going to haunt and pester all of your sponsors until they give in. You know what I'm saying? To me it just seems so petty and such a waste of time that you have to be front and center, proselytizing at every non-gay event.